Situated 11km away from Jaipur, 27 minutes drive from Hawa Mahal, the Amber Palace was declared a UNESCO World Heritage Site in 2013 as an example of Rajput military hill architecture. 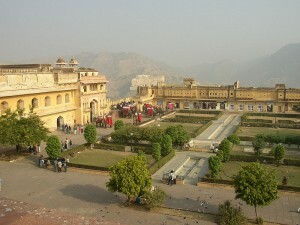 Amber Palace, Amber Fort, Amer Palace and Amer Fort are all different names referred to the same place. Amer is from Hindi आमेर. There are various opinions about where the name comes from. Some said it’s from the Ambikeshwar Temple while others said it comes from Amba, the protector of the world. Raja Man Singh built this palace in 1592. The royal family had been residing here until Jai Singh II decided to move the capital to Jaipur and a new City Palace was built. The Amber Palace is technically jointed with the Jaigarh Fort through a subterranean path. This allows the royal family in the palace to escape during wartimes. The Sun Gate leads you to Jaleb Chowk, the first main courtyard where the royal family would watch the victory parades when the winning army returned from battles . The second section, namely Diwan-i-Am, is the public audience hall when public affairs were discussed. The third section is where the royal family lived (except the royal ladies). A must-see in Amber Fort is the Sheesh Mahal (Hall of Mirrors). In the ancient time, royal ladies were not allowed to sleep in open air. To allow the queen to watch the stars, the Raja came out with Sheesh Mahal. Walls and ceilings are decorated with tiny mirror pieces that are cut at angles to make beautiful design. When candles are lit in the hall, the tiny mirrors turn the candlelight into thousands of stars. It’s certainly a breathtaking and unforgettable experience that you shouldn’t miss. The last section being the palace for royal ladies. This was the residence of queens and concubines and their female attendants. Elephant ride is a popular tourist attraction in Amber Fort. Though concern is raised that there may be cruelty to the elephants. Do pay attention to the conditions of the elephants before you decide to take the ride. Report to the authorities like People for the Ethical Treatment of Animals (PETA) if there is any concern.